The combo pack is an affordable treatment for your dog’s complete skin health. It is an effective combination in treating dogs with itchy skin. 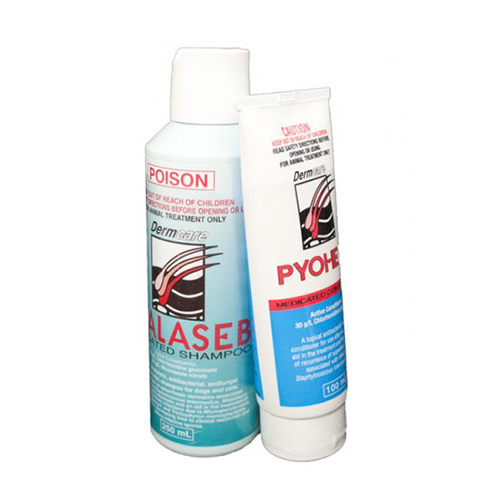 The pack contains Malaseb 250ml and Pyohex medicated conditioner lotion 100ml. Malaseb Dermcare is an ideal skin care for dermatitis in dogs, cats and horses. With the antifungal properties, it fights against fungi and yeast. It is a proven antimicrobial agent active against gram positive and gram negative bacteria. The shampoo effectively treats scaly and itchy skin. The medicated shampoo is also used for the treatment and control Seborrheic dermatitis. With no harsh chemicals, Malaseb is safe and does not strip off natural lipids from the skin. Pyohex conditioner is to be used in conjunction of medicated shampoo for effective treatment of bacterial skin infections in dogs. The antifungal conditioner eliminates bacteria and provides 14 days residual action by preventing further skin infections. The leave-on medicated conditioner along with Malaseb Dermcare shampoo provides a powerful protection against different skin conditions in dogs. First wet the coat then apply shampoo onto pet’s coat with the help of sponge. Allow to stay for 10 minutes then rinse it off thoroughly with water. Bath twice weekly until the symptoms subsides. Thereafter, use once in a week or as directed by your vet. Apply should always be used after shampoo. Take small amount of conditioner and apply it on the wet coat. Spread evenly and let it stay there without rinsing it. Wash hands properly after using the treatment. Do not allow your pet to lick or inhale shampoo or conditioner. My dog's skin has transformed from dry and dull to smooth and shiny. I love this product and would like every dog owner to use it. My pup’s skin is very sensitive skin. And this is one of the only shampoos that work for him. For the most part, it was beneficial. Really really recommend it for dermatitis. My dog has dermatitis and this caused flaky skin and rubbing these flakes would cause bleeding. Wasn't expecting such a dramatic result but I just used this once and the next day removed flakes without issues. Needless to say I'm gonna keep using this. It's a great combo pack and at big discounts too. This is a perfect grooming kit for my two doggies - Spark and Tiger. It goes so well with them that their coat really radiates. Can depend on this product. I bought this shampoo and cond a while ago to wash my border collie with. she had a skin problem. they told me to use malaseb dermcare shampoo.i did that and it cleared it up. if you don't shop around it will cost you heaps. vet supply is much cheaper so I stick with them now for all my dog and cat things now .so do my friends.